You got your first taste of processing digital input in Exercise 4 by working with a push button. This experiment introduces a Single-Pole, Double-Throw (SPDT) switch. You'll see how the Johnny-Five Switch class can be used with a variety of physical switches, including a magnetic switch that you can use to protect your lunch from marauding fridge raiders. 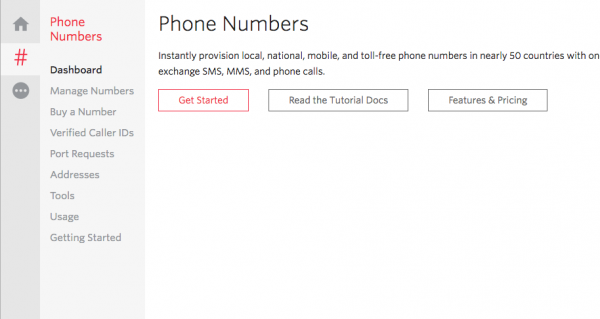 This experiment also includes the integration of a third-party module and service, Twilio, which you can use to send SMS text messages — now that's leveling up! SPDTs have three legs: one common leg and two legs that vie for connection to the common leg. The common pin is in the middle. It's always connected to one of the outside pins, but which pin it's connected to depends on which way the switch is flipped. The state of the switch — "on" or "off" — is read from the common leg. 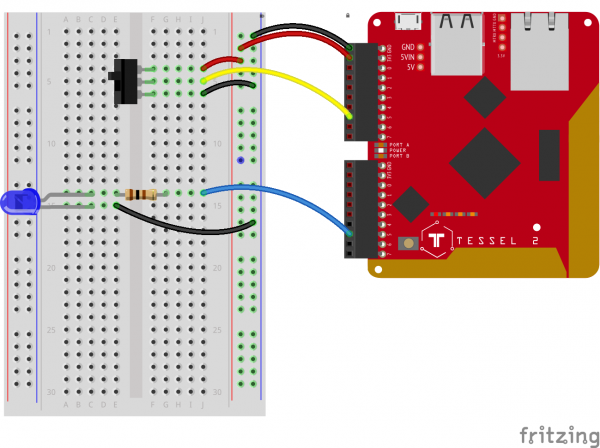 A connected digital input pin on the Tessel will read HIGH when the common leg is electrically connected to the +3.3V leg on the switch; that means the switch is "on." It will read LOW when the common pin is connected to the ground pin (switch in the "off" position). Note: The circuit in this experiment doesn't need a pull-down or pull-up resistor like the one in Experiment 4. That's because the common pin in the switch is always connected to something. There's never a "disconnected" state that can cause floating. There's a nice tutorial about pull resistors if you'd like to learn more. Plug the LED in, be sure to note that the anode is towards the top of the breadboard with each leg plugged into its own row. Place the 100Ohm resistor so that one leg is in the same row of hole as the anode of the LED and spans the ditch plugging into the row adjacent to the LED. Using jumper wires connect the cathode of the LED to the ground rail of the breadboard and the a separate wire connecting the end of the resistor to Pin 5 of Port B on your Tessel. Insert the SPDT switch into the breadboard so that each of the 3 pins insert into their own rows. Using jumper wires connect the upper pin of the switch to the positive power rail, the lowest pin to the ground power rail and the center pin to Pin 5 on Port A of your Tessel. 6.Finally power the breadboard using jumper wires! connect 3.3V to the positive rail and GND to the ground rail. Note: The minimum version of Node.js that runs on Tessel 2 supports many ES2015 features, including Arrow Functions, which we will be using throughout this experiment to simplify your program code. Next, create two event listeners: one for the close event (which means the switch is "on") and one for the open event (the switch is "off"). These events are conceptually very similar to the Button events that we covered in Experiment 4. Buttons are, after all, a kind of switch too. And that's it! Flipping the switch back and forth will cause Switch closed and Switch opened messages to display in the console (your terminal window's output). When the switch is in one position, the LED is off. When the switch is in its other position, the LED is on. Ever had a pesky coworker who has a habit of swiping your lunch? Let's try to catch her in the act! For this experiment, you're going to make a surveillance device that will send us an SMS text message when a refrigerator door is opened. In Experiment 4 and the first example in this experiment, you built circuits containing switches controlled by direct human contact: fingers pressing or flipping. The door switch included in the Johnny-Five Inventor's Kit is a little different: it is sensitive to a magnetic field. The switch assembly has two pieces. When the two halves of the switch assembly are very near each other, or touching, the switch is in one state. Moving the two halves more than 20mm apart from each other will cause the switch to change state. 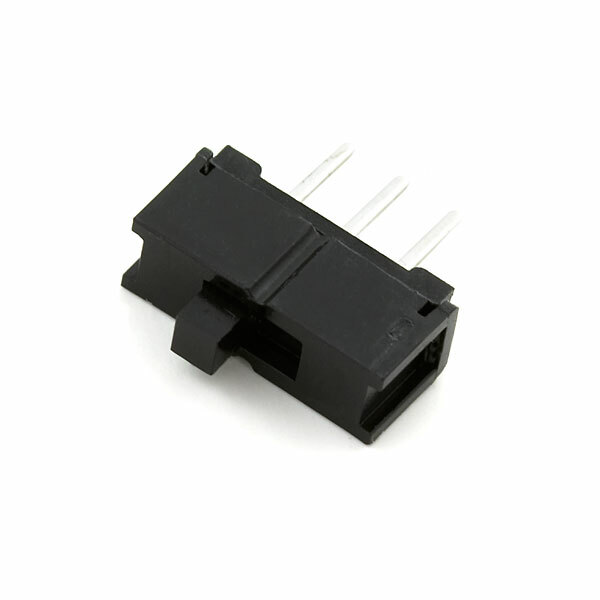 One half contains a magnet, and the other contains a reed switch, a switch that changes state when exposed to a magnetic field. This type of two-piece switch is often used in home-security systems. One half of the switch is attached to a fixed surface, and the other half to a moving door or window. When the door or window is opened, the two halves are separated from each other, breaking the contact and changing the switch's state. Using jumper wires, connect one half of the switch assembly to Port A, Pin 2 and the ground column of the breadboard's power rail. It doesn't matter which pin of the switch is connected to GND or the input pin — both orientations work fine. Plug in the LED. Connect the anode to Port A, Pin 5 through a 100Ω resistor. Connect the cathode to the ground column of the power rail using a jumper wire. 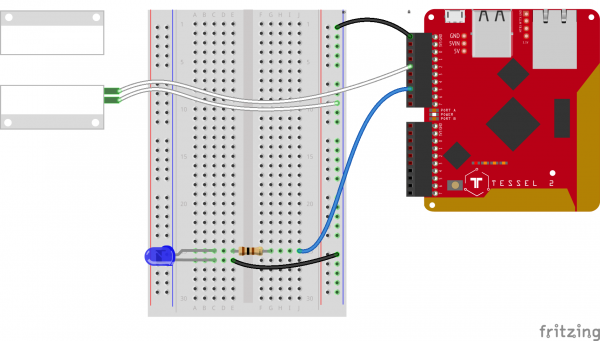 Connect the Tessel's GND pin to the breadboard's power rail using a jumper wire. Before we start sending SMS messages out into the ether, let's use the circuit above to create a prototype. This will prove our hardware is set up correctly. For the moment, instead of dispatching a text message, we'll indicate the switch's status with an LED. We'll turn the LED on when the "door opens" (switch halves are separated) and shut it off when the "door closes" (switch halves are near or touching). Opening and closing the magnet switch will turn the LED on and off, respectively. In this case, we're telling Johnny-Five to invert the switch, logically. Consider the default state of the circuit in the SPDT example above and the pushbutton examples in Experiment 4. In those, when the switches are in their "off" position (or the button is not pressed), the associated digital input pin will read LOW. Now, scroll back up and look at the wiring diagram image again for the magnetic door switch circuit. It would seem that when the two halves of the switch assembly are apart as shown, the circuit would be open and the digital pin would read LOW, like the earlier switch and button examples. However, the internal wiring of this particular magnetic door switch works in such a way that the pin will read HIGH. When a switch or component has this kind of architecture, we say that it is pulled high—the circuit's default, inactive state is HIGH rather than LOW. The invert option tells Johnny-Five to invert its interpretation of the Switch's states, such that HIGH reads correspond to the open event and LOW reads to the closed event. That way, pulling the two halves of the switch apart results in "open" and putting them together again is "closed," which feels correct. Note: Unless you pass a particular value for the type property, a Switch object instance will default to invert: true, so the behavior remains the same if you remove the invert:true from the code here. Get your API credentials. Navigate to your account's "dashboard". Write down (or otherwise keep handy) both the Account SID and your Auth Token — you'll need those for the program. 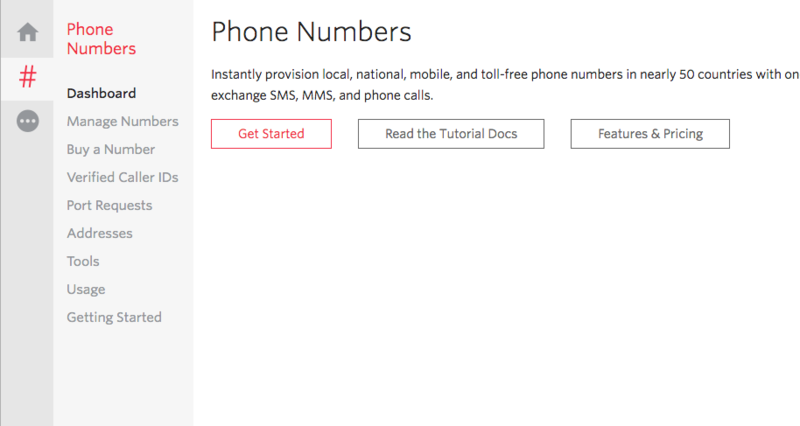 Set up a Twilio phone number. Start by heading to the Phone Numbers dashboard page. 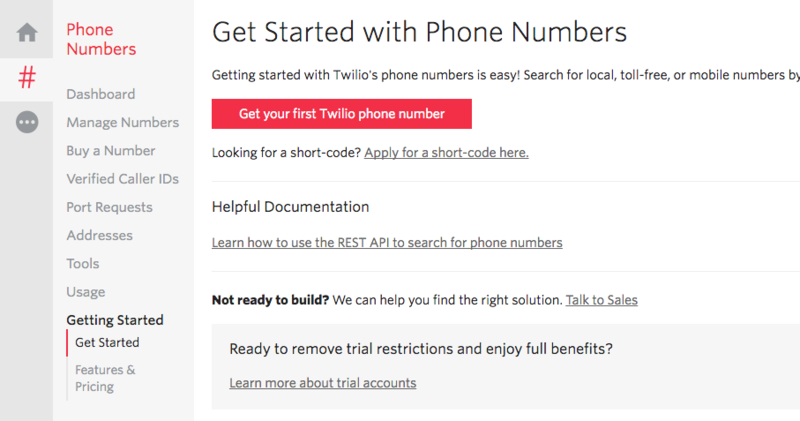 Click the "Get your first Twilio phone number" button and walk through the steps. Write down the number; you'll need this for the program too. When you remove the magnet, you should momentarily receive a text message warning you of an intruder! The script instantiates a Twilio client object with the defined credentials. That object takes care of communicating back and forth with Twilio. Then we rely on the Twilio client object for dispatching the message, invoking client.messages.create with the details object and also a callback function. If there is an error (the first argument to the callback function if so), log it to the console. Otherwise, we're good—the message was sent successfully. Turn a time lapse camera on and off -- use a switch to turn on a time lapse camera app using tessel-av.